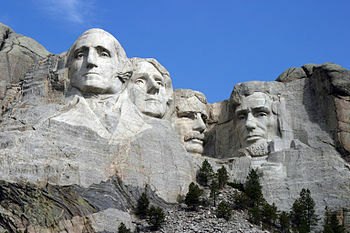 MOUNT RUSHMORE, n. An aesthetic disaster in South Dakota. A desecrated mountain bearing the likenesses of four dead politicians chiseled into its flanks–in other words, graffiti “tagging” taken to its logical extreme. Every year, this unnatural wonder is reverently viewed by hundreds of thousands of camera-toting, polyester-clad Americans, a people who cherish kitsch ugliness as they do the infliction of pain.